NASA has long been a leader in understanding the science of space weather, including research into the potential for induced electrical currents to disrupt our power systems. Last year, NASA scientists worked with scientists and engineers from research institutions and industry during a pair of intensive week-long workshops in order to assess the state of science surrounding this type of space weather. This summary was published Jan. 30, 2017, in the journal Space Weather. 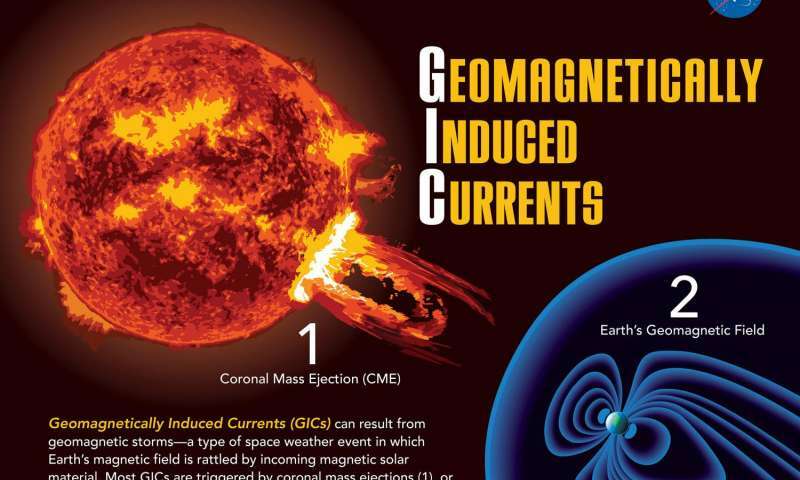 Storms from the sun can affect our power grids, railway systems and underground pipelines through a phenomenon called geomagnetically induced currents, or GICs. The sun regularly releases a constant stream of magnetic solar material called the solar wind, along with occasional huge clouds of solar material called coronal mass ejections. This material interacts with Earth's magnetic field, causing temporary changes. That temporary change to the magnetic field can create electric currents just under Earth's surface. These are GICs. Long, thin, metal structures near Earth's surface—such as underground pipelines, railroads and power lines—can act as giant wires for these currents, causing electricity to flow long distances underground. This electric current can cause problems for all three structures, and it's especially difficult to manage in power systems, where controlling the amount of electric current is key for keeping the lights on. Under extreme conditions, GICs can cause temporary blackouts, which means that studying space weather is a crucial component for emergency management. "We already had a pretty good grasp of the key moving pieces that can affect power systems," said Antti Pulkkinen, a space weather researcher at NASA's Goddard Space Flight Center in Greenbelt, Maryland. "But this was the first we had solar experts, heliospheric scientists, magnetospheric physicists, power engineers and emergency management officials all in a room together." Though GICs can primarily cause problems for power systems, railroads and pipelines aren't immune. 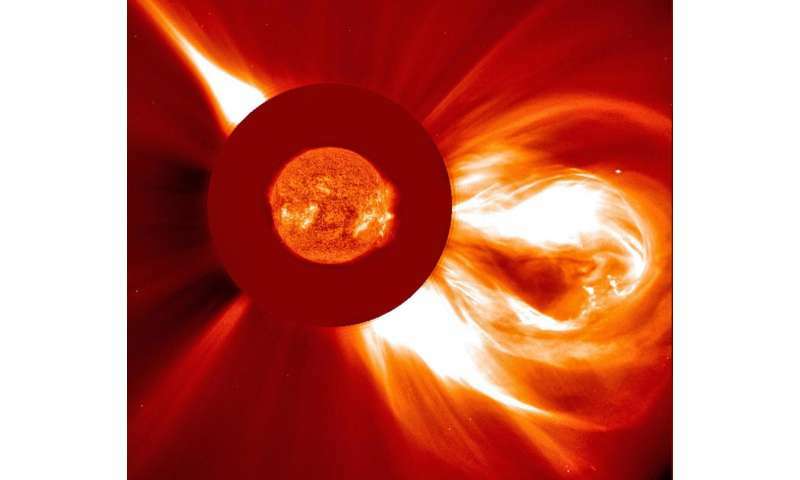 "Researchers have found a positive correlation between geomagnetic storms and mis-operation of railway signaling systems," said Pulkkinen, who is also a member of the space weather research-focused Community Coordinated Modeling Center based at Goddard. This is because railway signals, which typically control traffic at junctures between tracks or at intersections with roads, operate on an automated closed/open circuit system. If a train's metal wheels are on the track near the signal, they close the electrical circuit, allowing electrical current to flow to the signal and turn it on. "Geomagnetically induced currents could close that loop and make the system signal that there's a train when there isn't," said Pulkkinen. Similarly, current flowing in oil pipelines could create false alarms, prompting operators to inspect pipelines that aren't damaged or malfunctioning. In power systems, the GICs from a strong space weather event can cause something called voltage collapse. Voltage collapse is a temporary state in which the voltage of a segment of a power system goes to zero. Because voltage is required for current to flow, voltage collapse can cause blackouts in affected areas. Though blackouts caused by voltage collapse can have huge effects on transportation, healthcare and commerce, GICs are unlikely to cause permanent damage to large sections of power systems. "For permanent transformer damage to occur, there needs to be sustained levels of GICs going through the transformer," said Pulkkinen. "We know that's not how GICs work. GICs tend to be much more noisy and short-lived, so widespread physical damage of transformers is unlikely even during major storms." The scientists who worked on the survey, part of the NASA Living With a Star Institute, also created a list of the key unanswered questions in GIC science, mostly related to computer modeling and prediction. The group members' previous work on GIC science and preparedness has already been used to shape new standards for power companies to guard against blackouts. In September 2016, the Federal Energy Regulatory Commission, or FERC, released new standards that require power companies to assess and prepare for potential GIC disruptions. "We're really proud that our team members made major contributions to the updated FERC standards," said Pulkkinen. "It also shows that the U.S. is actively working to address GIC risk."